I seem to be all planned out. I've done meal planning, home-ed group planning, blog ideas planning, home-education planning, and house decorating planning. Phew! Last week has whizzed by in a sort of super blurry blur, and I feel as if I'm on some sort of exceptionally fast high speed train and I can't find any way to get off. Still, it's almost all good so can't complain. On Monday we didn't go to our usual home-ed group meeting, preferring instead to have a baking, art, and reading day. Tuesday was my favourite day of the week, as we headed off to spend a lovely few hours with friends. Pizzas and cakes were consumed, role playing games were acted out, a stroll to the beach was enjoyed, and various movies and music videos were watched. Taisia entertained everyone with her little ways, and I received a lesson in using Powerpoint, so it was a rather fruitful day. Wednesday, again we missed home-ed group. I spent much of the day rearranging the dining room, sorting through our home-ed resources, and finding lots of things that have inspired me for future "schoolwork". The children played board games, including Monopoly and Game of Life, read books, watched a Viking documentary and helped me work out our finances. "Pwease" = Meaning please, as she reaches up for or points to what it is that takes her fancy. "Batpan" = Thanks to Chelsea singing the Batman theme tune. "Cookie" = When she wants the C is for Cookie song on. "Jo Jo" = when calling Joseph. "Harry" = This is said really clearly when talking about or calling our cat. "Keer" = Short for Kira our dog. "Whatisit?" = What is it? Sometimes said as "Whatsat?" "Up" = when wanting to be picked up or sit on the sofa. "Pat Pat Pat" = as she's stroking the dog or cat. She roars when she see's dinosaurs, lions or tigers, and miaows when she see's a cat. She "awwws" when she sees animals or baby's. I've just had an appointment through for her developmental check and cancelled it. I see no point in wasting my time and that of the health visitor's when it's clear she has no issues with vision, eyesight, health, or development at this stage. 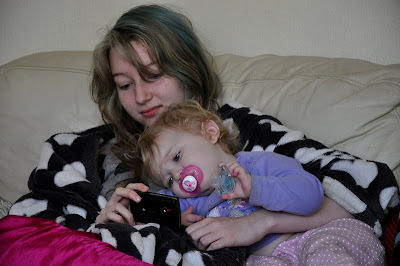 This snuggling time gave me some much needed respite, and allowed me to get on with planning group meetings for the Teignbridge and Torbay home-education group. I've planned meets up until March 5th, so feel quite pleased with myself! Future meets include visiting a zoo, a National Trust property, travelling to Cornwall, and visiting a park/nature reserve. Friday. I dyed Chelsea's hair red for her before the teens went to youth club in the evening. She wants it a much brighter red, but we did a basic red as a base coat. The day was spent writing stories, looking at what we needed to get for science experiments, and reading through some bird spotting literature. Joseph did more research into what he needs for a career in forensic science, whilst Chelsea starting researching contacts for the make up industry. The weekend. Saturday we went to Torquay. We had a snack in one of the pubs, and bought new books. Chelsea got "Kiss, Date, Love, Hate" by Luisa Playa, whilst Tiegan bought "The Longest Whale Song", by Jacqueline Wilson. We also bought "War Horse" by Michael Morpugo, which will be next months chapter book. Tiegan and I went through a few ideas for lapbooks and project ideas, and Joseph read some of the British History book to Callum who has started to show a real interest in historic events. On Sunday we stupidly decided to go to Trago Mills, which was over the top busy and not particularly pleasant to walk around. I did treat myself to a new knitting and crochet book, which will prove to be very useful I suspect, particularly when I'm creating new pieces for the nature table display or taking part in Season's swaps on the Greenparent forum. Now, don't look too closely as there are mistakes. I know it's not perfect. I know it's not anything special. I know that I'm bloomin' proud of myself. I know that I'm grinning from ear to ear as it feels as if I've made a breakthrough. For pretty much 10 years, on and off, I have been desperately trying to teach myself how to crochet. I just didn't "get it". I couldn't see where the hook had to go in the chain, I couldn't see where the hook had to go to make a stitch, I just couldn't do it. Full stop. 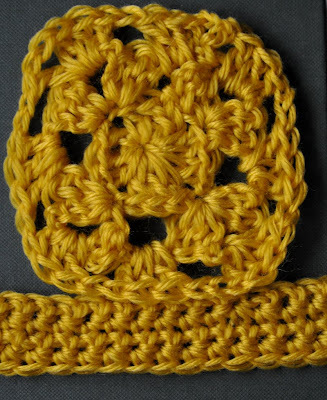 I'd tried learning from books, from magazines, from website tutorials, from watching people, and from the ol' trusty YouTube videos, but all to no avail, I had almost resigned myself to never being able to crochet which was horrid. There are so many utterly fabulous patterns out there that are crying out for me to make them. In the early hours of this morning, it all fell into place. Why the change, I don't know, but all of a sudden I could clearly see each stitch and where the hook needed to go (this doesn't mean it always went in the right place mind you - hence the few mistakes!) So now dear readers, I can foresee my home becoming a haven of multi-coloured granny-ness, with crocheted blankets and throws, cushions, artwork, toys - the list goes on and on. Can you tell I'm just a teeny weeny inchy winchy bit utterly fantastically chuffed with myself? In other utterly fabulous news, the giveaway is coming together nicely. 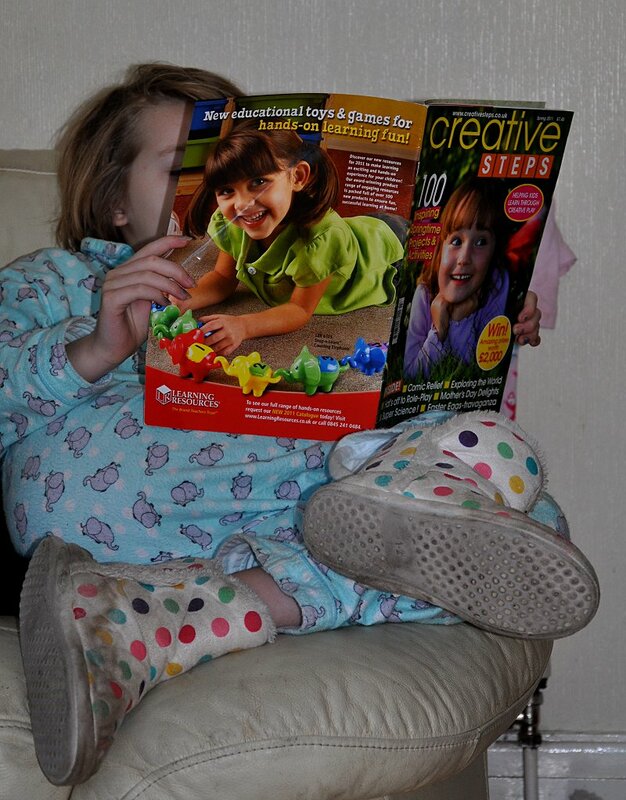 I am awaiting to hear from a few companies I've contacted, but I am very happy to tell you that the very nice people over at Creative Steps magazine have offered a free year's subscription for the winner. The magazine is only available on subscription, and I was a little dubious as to whether it was good value for money. However, I have been sent a few copies to review, and wow, I really like it. I will write an in-depth review in the coming week when we have had chance to make some of items that are contained within it, but definitely on first impressions I'm loving it. love it when an update comes through! you are a great inspiration for me as a 'new to home ed' mama. I have just takem a look at creative steps and it looks fab - i look forward to your review although I am tempted to subscribe already!